Correlations, interactions and topology in electronic systems lead to fascinating condensed matter phenomena including superconductivity, magnetism, and topological states of matter. 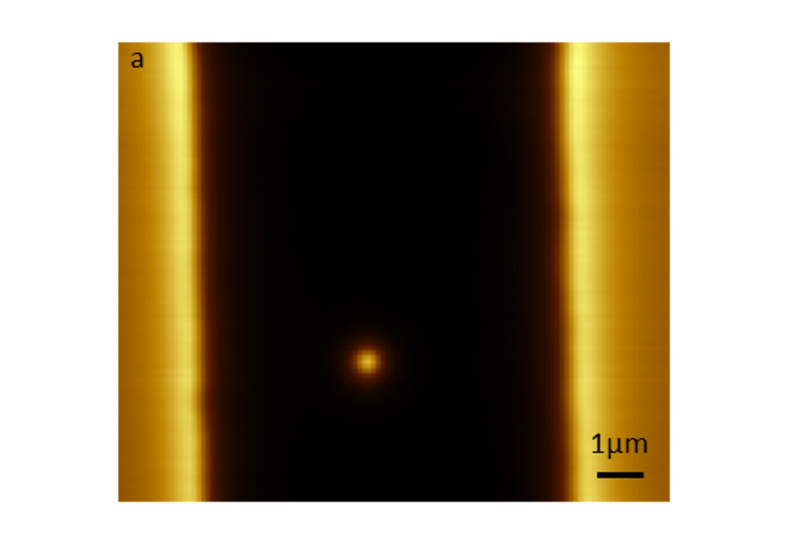 Our group focuses on study of nanoscale phenomena and dissipation in quantum matter and strongly correlated systems using unique scanning probe techniques. 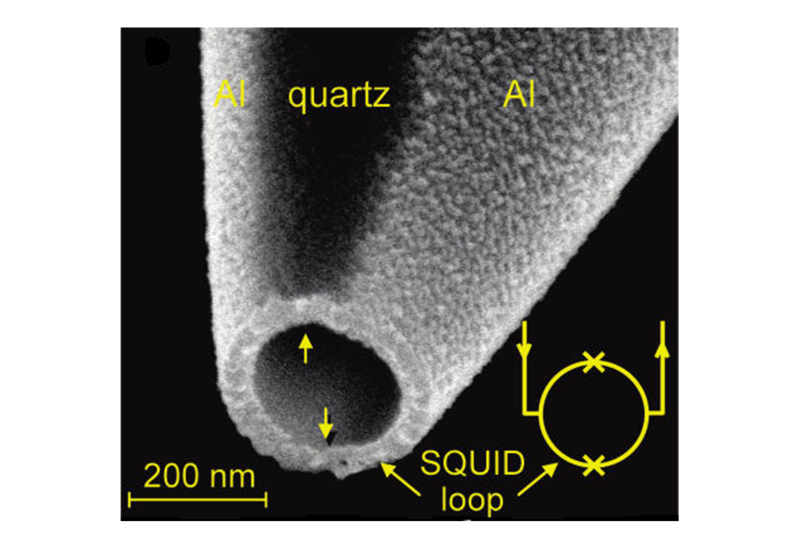 We have recently developed the world smallest and most sensitive Superconducting Quantum Interference Device (SQUID) that resides on the apex of sharp pipette forming the optimal geometry for scanning probe microscopy. 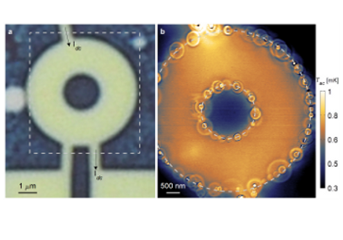 These SQUID-on-tip (SOT) devices with size as small as 50 nm can scan at heights of few nm above the sample surface providing the means for investigating local magnetic, electric, and thermal phenomena in novel states of matter. The record spin sensitivity of the SOT provides a unique tool for study of local magnetic phenomena and may allow detection of the magnetic field arising from the spin of a single electron. Using our home built cryogenic scanning probe microscopes we study emergent magnetism and current distributions in a number of novel systems including vortex dynamics in superconductors, topological insulators, oxide heterostructures, quantum Hall states (QHE), quantum anomalous Hall state (QAHE), graphene and van der Waals materials, nanomagnets, and molecular magnets. The SOT devices display extraordinary thermal sensitivity allowing measurement of local temperature variations as small as a μK. We are currently developing a unique nanoscale thermal imaging microscopy that is four orders of magnitude more sensitive than any other method and is the only technique that provides thermal imaging at cryogenic temperatures. Our goal is to study the fundamental processes that govern the dissipation in quantum systems and novel states of matter including scattering, decoherence, electron-phonon coupling, and breakdown of topological protection. Systems of particular interest are quantum Hall, quantum spin Hall, superconductors, topological insulators, Weyl semimetals, carbon nanotubes, and graphene and van der Waals devices. In addition to being an extremely sensitive magnetometer and thermometer, the SOT can also act as a scanning nanoscale gate. By applying a potential between the SOT and the sample the local electronic configuration of the underlying material can be controllably varied and the corresponding electric, magnetic, and dissipation responses can be imaged simultaneously. We are utilizing this one of a kind microscopic tool to study nanoscale electronic properties of novel low dimensional systems and topological states of matter. In this web site you can read about our research, browse through our publications list, or see who our present and former group members are.